However, for the millions of individuals with speech and language impairments, reading the daily news is a struggle. The inability to read or comprehend the day’s top headlines can cause or amplify feelings of isolation and depression. We set out to change this dynamic by delivering the news in an easy-to-use, easy-to-comprehend website. 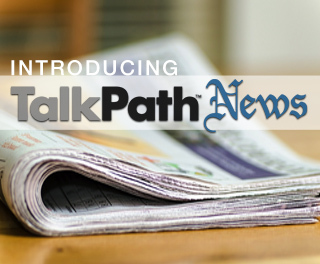 We are excited to introduce the latest product in the TalkPath suite, TalkPath News. Articles that are read aloud: When a user opens an article, the article will be read aloud in a simple and slow pace. For users with reading limitations, this is a slower and more accessible option, as sometimes the broadcast news is too fast to comprehend. Articles that highlight text: Each sentence is highlighted as the news anchor reads the article. This offers the user a visual cue and focuses attention on one sentence at a time. Useful control buttons: At the bottom of each article are a series of buttons to assist the user with the article. Users will see back, play, forward, and a start over buttons. There is also a section for users to leave a comment or share it on social media. The latest headlines: The headlines and photographs are the same or very similar to the ones you would find in top publications. Users will find news articles are posted Monday through Friday. Comprehension questions: Every story ends with a series of questions — sentence completion, multiple choice, or vocabulary — about the article. Performance on these questions, as well as how long each took, are tracked and reported back to the user. TalkPath News is appropriate for clinicians or individuals with a speech and language disorder. To access the site or the app users need to create an account and log in. It’s that simple…and FREE.